CONSTRUCTED OF 5 OZ. NON-WOVEN FABRIC, ATTACHED WITH METAL CLIPS TO GALVANIZED WIRE. 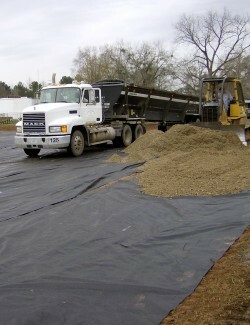 LIGHTWEIGHT & EASY TO INSTALL USING SANDBAGS. GUTTERGUARDS ARE NEEDED TO MEET GOVERNMENT STANDARDS, PREVENTING SEDIMENT DRAINAGE RUNOFF FROM ENTERING MUNICIPAL SYSTEMS. DESIGN ALLOWS CLEAN WATER TO FLOW THROUGH WHILE TRAPPING SEDIMENT.